$399.00 & FREE Shipping on orders over $59. 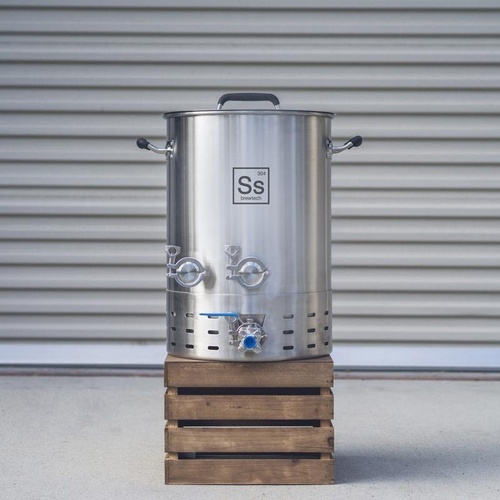 Ss Brewtech took the features of pro brewing equipment and shrunk it down for the homebrewer with their new Brewmaster Edition Kettles. Built from high quality 304 stainless steel this kettle has it all. Rotatable racking arm and sight glass allow complete control of trub pick up. 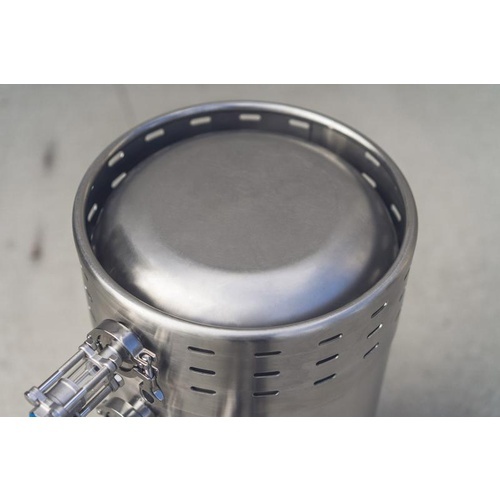 Also, the dish bottom and integrated fire box allow for faster boil times because of the increased surface area. All TC fittings are fully sanitary and the whirlpool coupler has a tangential inlet which provides a more effective whirlpool. 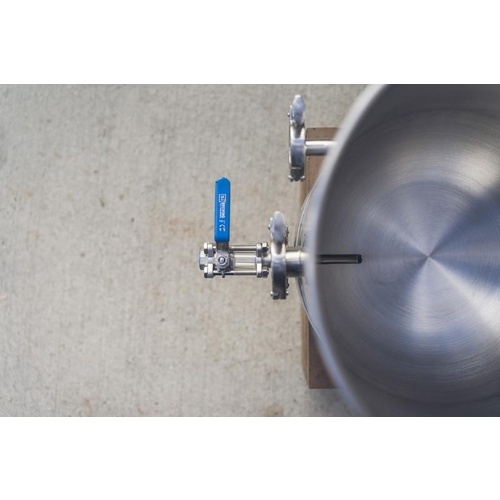 The BME Kettle from Ss Brewing Technologies has a feature set unmatched in the homebrewing market. Note: Not intended for use with induction burners! 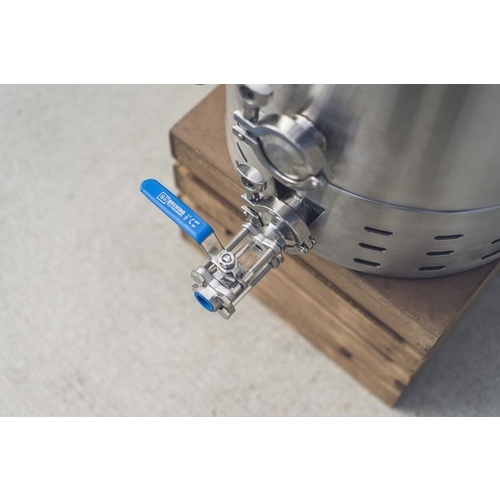 Ss BrewTech Brite Tank - 10 gal. curious on which fitting is best for the whirlpool valve hose barb or MPT? I will be using a blichmann riptide pump. BEST ANSWER: I purchased a 1/2 inch stainless ball valve with 1.5 inch tri clamp fittings and attached my hose with a tri clamp to cam lock adapter, but I will be replacing the ball valve with a quick clean 1.5 inch tri clamp ball valve since the standard ball valve is hard to disassemble clean and gets pretty dirty inside. I use a female quick disconnect so I can remove the hose anytime I'm not using it. My Brew Kettle doubles as my mash tun and my boil kettle so I move my hose around a bit. It just makes everything that much easier to have quick disconnects on all my hoses. I use ss quick connects. Male on the kettle and female on the hose. Hi, could someone providencia with the dimensions of the package and also how much is the shipping weight? BEST ANSWER: The shipping weight is 35.2 pounds. Just did my 1st brew, and it was great. Really like the whirlpool. Added one of these to my setup a few months back and I love it so far. It's nice attaching valves with the triclamp fittings because then you can pull them off for cleaning. The kettle fits in the sink a lot easier without a bunch of valves hanging off. Also less chance of damaging a weld or something. 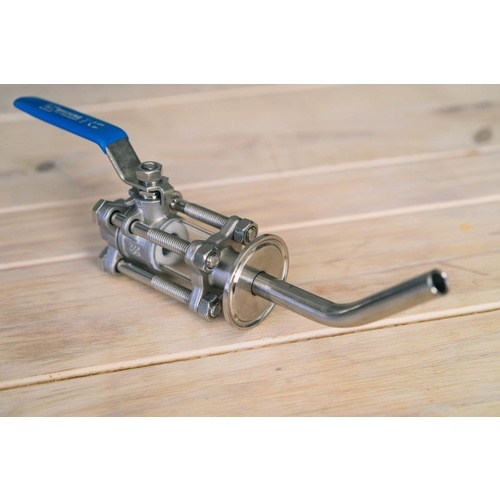 I still use quick disconnects on the hose side of the valve, because QD make brew day a lot easier, but I retrofitted the rest of my equipment so that the valves attach to my HLT and Mash Tun with triclamp fittings. I also like the weight of this kettle. I've been home brewing long enough to appreciate that "heavy duty" equipment sounds nice but is often too heavy to move around easily. The only annoying thing with this kettle is that the collar around the base is so large that it doesn't sit well on your standard camp stove. That said, I see it as an excuse to get a bigger burner.